I recently had the pleasure of photographing one of the dearest places in the world to me. The house of the the Marriott family, just up the street from mine in Salt Lake City, was always somewhat of a 2nd home for me. Our two families were like peanut butter and jelly - little bare feet going freely between the two houses. In the summer and after school my Mom’s limit was home for dinner at 6 but other than that we were free to roam. David & Neill Marriott are the kind of people that you want to grow up to be like. Each full of personality paired with deep integrity of character and steadfastness. I read in a book once where the author in describing a person said “you could warm your hands by the fire of their faith.” That is the Marriott’s to me. The Marriott’s have lived in this home for over 35 years. It is where they settled down and raised their 7 sons and 4 daughters. Neill describes her style as “European Country” which she really highlights in her main family room. This parrot painting in the family room hung in David’s mother’s dining room and is a favorite of the grandchildren because it includes a wasp, a caterpillar and a fly among the fruit. Neill was born and raised in Louisiana as a southern methodist, her cheery accent and great depth of character has been a light for me throughout my life. She wrote a book called “Seek This Jesus” about her journey of finding faith in Jesus Christ and the path that has led her to who she is today. If you are looking for a fast and easy read that is also interesting and inspiring, I highly recommend it. Her home is filled with meaningful pieces of furniture, artwork, history and a spirit of place that comes from a tight-knit family all growing up together in that house. Those blue and white vases that stand on the piano were displayed in Neill’s great-great-great grandfather’s Pre-Civil War home in Arlington, Louisiana. That piano was the practice piano for years of violin, cello, viola, trumpet, trombone, clarinet, bass, and sax accompaniment. I myself did my fair share of banging on those keys. Neill knew she wanted blue and white paisley curtains that had a close pattern for the large arched windows. After looking through many fabric stores, she found just what she wanted at Walmart for $5-$6 a yard. Instead of the much higher prices of the designer stores! Her southern upbringing shows in her choices. Each space so lovingly curated in her timeless traditional style. This painting in the dining room is of Neill’s great-great grandfather. It, too, has been part of four generations of their family homes. 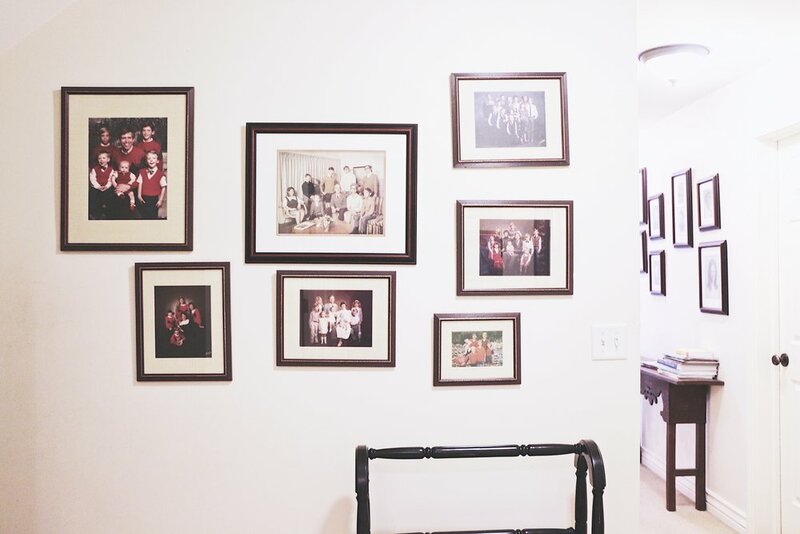 I love the display of family photographs in the hallway. I have a goal to put more pictures of my family in my house. As a kid that always made me feel special to see my picture on the wall. With over 30 grandkids and more to come, the Marriotts have a lot of family to be proud of. A big thank you to Neill Marriott for letting me come and photograph her house. I could’ve spent hours looking at each special piece and hearing her stories. (But I have 3 small children that would not let that happen.) I think it’s important to visit moments from our past. It helps us remember why we are who we are. Are there places that are important to you that define you like the Marriott’s house is for me? There is still more of the house. Look for two other features: One about the upstairs bedrooms and another about the master bedroom and home office. They are really unique and special. Let me know if you have any questions in the comments below!